Check out my new article on boring! Finally, the first wood for the scalable table build is acclimated, and ready to build with! For a piece of furniture to have a chance of surviving without cracks appearing after it's been in the home for a while, the timber should be brought to a balanced moisture content with the home environment. We say it has been acclimated. Centrally heated homes will generally have humidity around 40 to 60%, and a piece of wood left in the home will settle with a moisture content of around 8 to 12%. These figures aren't greatly significant, but what is is that wood will contract as the moisture content lowers. By far the vast majority of this movement is across the grain, and this is the what can cause problems. Consider a mortise and tenon joint, where the grain direction of the components are at right angles to each other. The mating, long grain, glue surfaces will expand or contract in different directions to each other, as the moisture content changes. Either the glue or the wood will end up breaking, and with modern adhesives it tends to be the wood. So, I shall be taking the first chance I get to make a start on building the first table. Watch out for updates on social media, video on YouTube, and backup information here on the blog. Thanks to demand, I'm doing a new project. Really appreciate all the sub's and views since my last video. Please share and help me hit 1000 sub's by my birthday. For some reason, the Google+ follow links on my web pages and YouTube are different. I don't know why, and I'm not sure how I can change this. If you wish to get all notifications then please follow BOTH for the time being. That means clicking the follow buttons on this page, and also on my YouTube channel. I will attempt to consolidate the multiple identities, and keep you posted. I shall be making a table for my Get Into Woodworking channel soon. 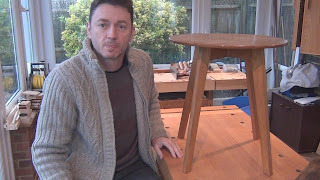 This will demonstrate some more woodworking techniques, and furniture construction. The design will be flexible, allowing you to scale it up to a dining table, or down to a doll's house table, but I shall make it as an occasional, or side, table. Please send me your thoughts on what you would like me to build it out of. The options are from free pallet wood, through spruce and pine, to native British hardwoods. I will not sell your data to a third party, unless you specifically request me to. All content copyright Mitch Peacock 2015. Simple theme. Powered by Blogger.